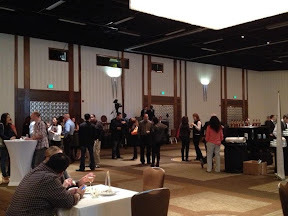 As promised, I am writing a post from the Latinos in Social Media Conference in Houston. Tonight was the welcome reception at the Hyatt in downtown. For me, it was like a reunion. I’m a proud Houstonian and I went to school here. I am an alumni of the University of Houston and cut my teeth in news and literature here. So many of my friends are attending the conference and, ironically, some of us have had similar life adventures even though we lost touch after college. I’m looking forward to catching up. So here’s a quick vlog about the first night. I’m working on another post, a writing post, for Friday. I’ll try to write and post between panel discussions. If you want pictures, follow me on Twitter (you can follow the link if you press the big blue bird on the side rail). To hold you over, here’s a pic from right at the start of the reception.